(A) Schematic of the HIVE assay. 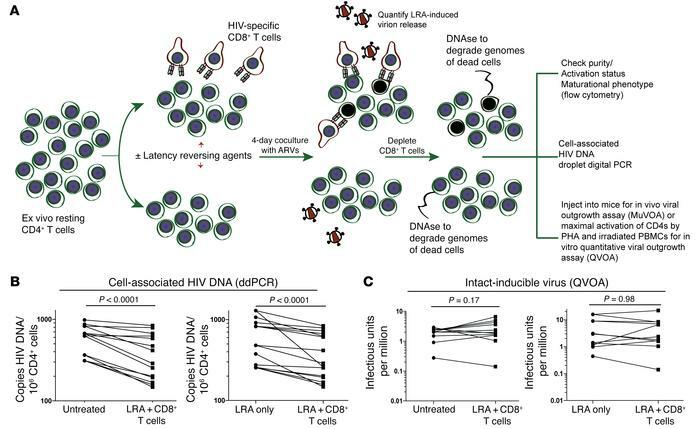 (B) Comparison of the 10 HIVE assays in this study, between either untreated or LRA-only levels of HIV DNA, with levels after treatment with LRA + CD8+ T cells. (C) Comparison of the same 10 HIVE assays in this study between both untreated and LRA-only IUPMs, with those after treatment with LRA + CD8+ T cells.